Mentioned in my previous post that I visited IDS for a review and facial. My therapeutist that day was Ms Ambria Tee. Many other clinics/salons use crystal or diamond peel but at IDS Clinic they use Hydrafacial! What Hydrafacial does is it uses a high power water jet stream to do dermabrasion. This is actually much more comfortable and also less painful compared to crystal or diamond peel. On top of that, the water solution used contains multi minerals! Here comedones that are rooted to the pores are firstly cleared using ultrasound. After that step is completed, there will be some minor extraction of the more stubborn ones. P.S I'm sure you can spot more red spots on my face after this step. The extraction actually wasn't that painful lols. It's just that my skin is very sensitive and it turns red very quickly. Now for the main therapeutic treatment; a light based treatment with suction! What the light does is it kills the bacteria on your skin and hence controlling acne. I was told that the suction will bring he skin closer to the light so that results will be better ;) It's really unique cause I've had light treatments at other salons before but none had the suction. So what happen is that your skin will be lightly sucked by the machine then the light will be shone on your skin. It's not super taut and not painful at all so don't worry. Time for some more pampering! Here the same ultrasound machine will be used to penetrate vitamins into the skin. 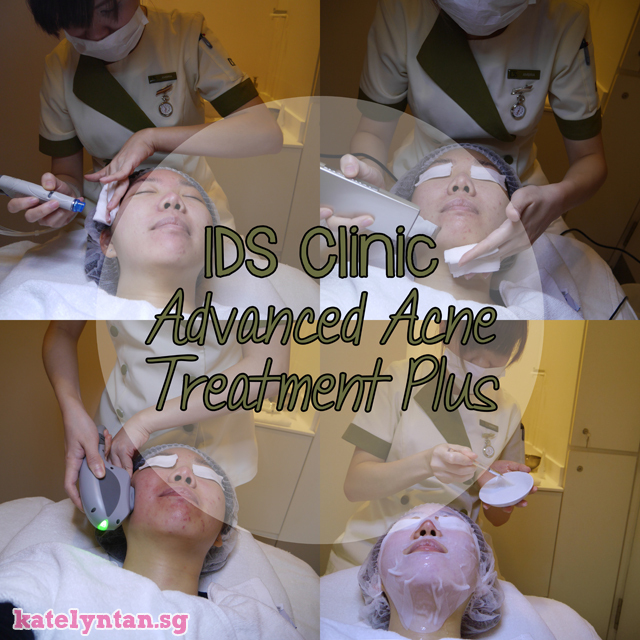 The whole treatment will be end after a cooling anti acne mask to ease off red marks. This is my favorite step and most of the time I will fall asleep haha. As you can see in the next photo, most of the red marks were gone! Here's a photo after treatment! If you look at the photo collage earlier, you should be able to see that my skin got a lil red after the extractions. But the cooling mask managed to tone down all the redness! 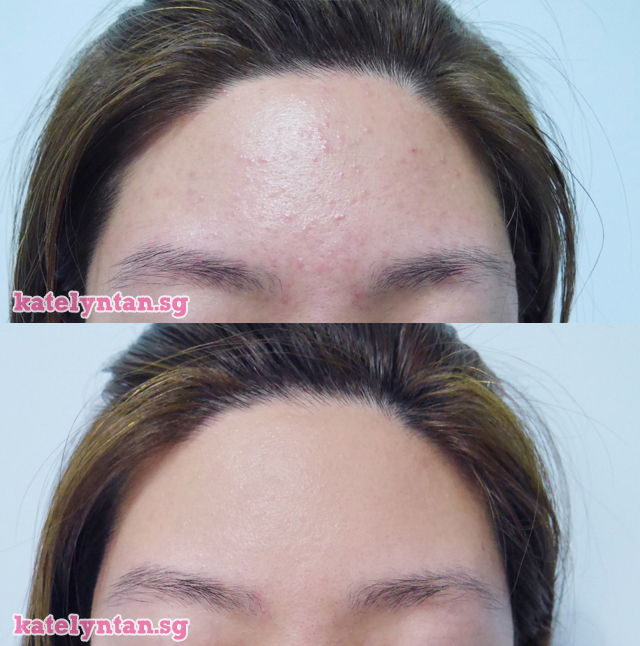 ♥ The whole treatment cleared all my clogged pores and made my skin super smooth too! I kept wanting to touch my face after that hahahas. Now for the next part of this review... a new product at IDS Clinic! It's CLEAR 10, an improved version of their original CLEAR. I ran out of the magic gel that they gave me and this was a replacement. I believe that magic gel is in this too cause the texture is similar! Here's a photo of CLEAR 10 and my receipt for the day! As mentioned in the previous post, I'm currently a paying customer and no longer sponsored. cause I only told that I wanted to top up some products after this receipt was generated. I didn't take a photo of another receipt since I'm only gonna mention about CLEAR 10 in this post. As the facial cleared all my clogged pores, I actually didn't need this product. I had a breakout on my forehead after using a cosmetic product. So I managed to take photos to show how well the CLEAR 10 worked! TOP was taken BEFORE using. BOTTOM was AFTER using for 5 days. It was especially bad on my forehead as shown in the photo above! That's all for this review!